This work was a finalist in the 1924 Archibald Prize and was acquired by the Gallery in 1939. Signed and dated l.r. corner, grey oil "A. Dattilo-Rubbo/ Sydney 1924.". Signed u.r. verso, brown oil "A Dattilo-Rubbo/ ...". Signed upper c. verso, black charcoal ".../ A.Datillo-Rubbo". 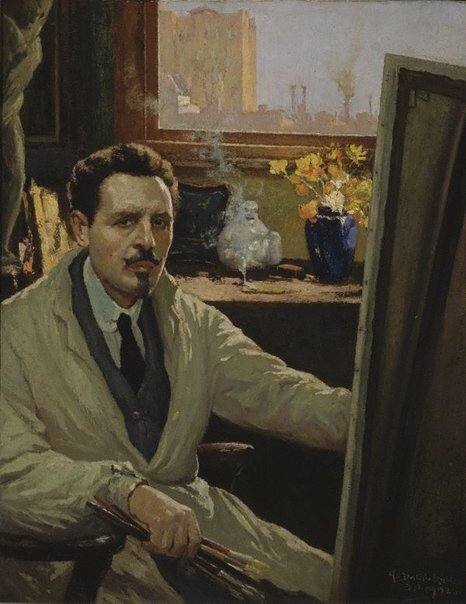 Emma Collerton, Australian Collection Focus: Antonio Dattilo-Rubbo , 'Antonio Dattilo-Rubbo', pg. 2-5, Sydney, 2011, cover (colour illus., detail), 12 (colour illus.). Emma Collerton, Look , 'A passionate artist and teacher', pg. 46, Sydney, May 2011, 46 (colour illus.). Modernism and Feminism Australian Women Artists 1900-1940 , Sydney, 1996, 60 (colour illus.). S.A. Parker Framing Works , 'Works in the collection with known Parker frames', pg. 27-68, Sydney, 2004, 30 (illus.). Fifty years of Australian art 1879-1929 , New South Wales, 1929, 29 (colour illus. ).